I'm scheduled to get my hair cut Saturday. For the first time in a year. Preface: This might be vain. But. It's my blog. My hair's getting really long, and I normally go from long to short to long to short, so I would normally just cut it all off at this point. But I've seen so many cute hairstyles lately--short or long or...banged--that it's been hard for me to choose. I have compiled some pictures to help me make my decision. Here's my hair at the longest and shortest it's been in recent years in both curly and straight forms. I kind of think that my face looks better with short hair but that my hair itself looks better long. Okay, I'm well aware that my hair will never look like that of these girls. I can never get it to curl much, but on its best long days, it looks kind of like a brunette version of Whitney's here. These girls look adorable with bangs, which kind of makes me want to try them. My face is oval, so I could pull it off, right? But I had bangs when I was little and definitely looked better once I got rid of them. 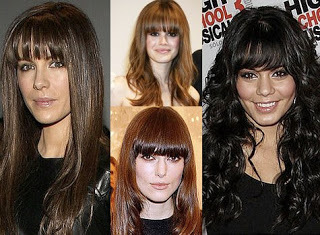 And all too often, bangs end up looking terrible. I think I might just get my side bangs cut back in. Oh, how I've missed them. I feel like those are a lot harder to mess up. Oh, oh, but then I see girls with short hair. And how cute do they look? Yeah, I know Kelly's on there twice. Two different years. I think short hair makes girls look confident, too, because too many girls with long hair seem just to hide behind their locks. I think I'm going to get the side bangs cut back in and let it keep getting longer until March-ish, and then, when it's really long, I'll get it all cut off like Hayden's above. Thoughts?